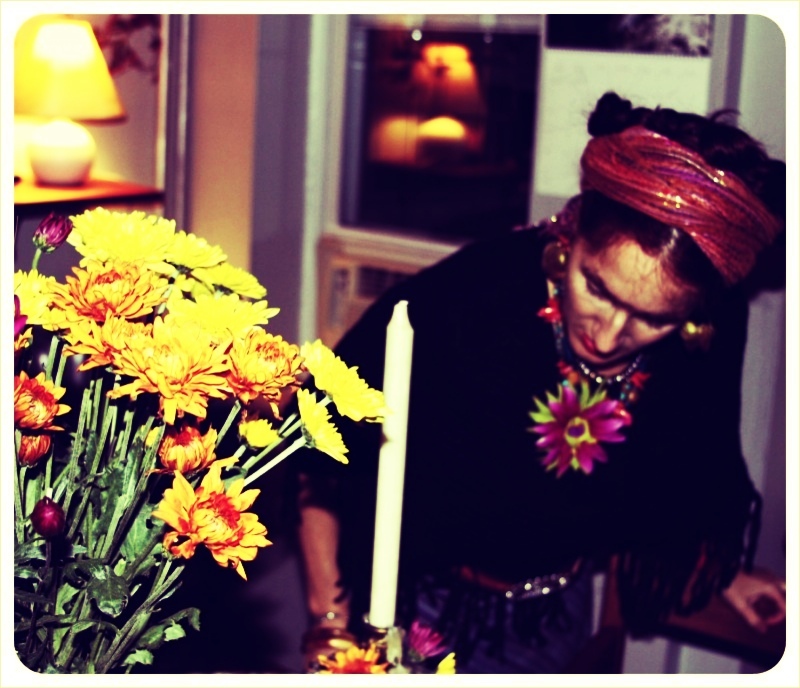 On Saturday, I built an altar. Yes, a cheese altar. I wanted to honor the spirits of cheeses past, like this lovely Gran Queso from Emmi Roth Käse. In October, I had the privilege of touring the plant where this cheese was made, and I can still picture the factory -- a little chalet on the Plains. Emmi Roth Käse looks like the kind of cheese factory the Von Trapp family might have built, had the singers become cheesemakers. It even has window boxes. Inside, it’s all business. Swift and Swiss. Rind-washing robots move through soaring garages, and men with beard nets and booties slosh through floor sanitizer, clipboards in hand. One corridor smelled sweetly of paprika, from the spices that are rubbed into this cheese. Emmi Roth Kase is known for its Alpine cheeses, specifically its Grand Cru Gruyere which is sold around the country (I buy it at Wegmans). Below, you can see the vastness of the cheese caves; each wheel is perfect, and the place is pristine. Emmi Roth Käse also makes a line of Spanish-style cheeses. The company's Gran Queso picked up a first place award at the Amercian Cheese Society conference a few months ago. Gran Queso is a lovely cheese, like toffee with mild chili pepper. We ate it on apple pie, after a round of soft tacos and talk about dead loved ones. It was a lovely wedge for a Day of the Dead dinner party, since it’s a little smoky and very dry. This cheese also worked quite nicely alongside Day of the Dead bread (above) and the fresh corn tortillas I picked up from Tortilleria y San Roman in the Italian Market. If you live in Philly and you haven't visited this hole in the wall on a Saturday to buy a $2 stack of hot tortillas, you need to embrace this near-death experience. Be sure to stand on the corner of 9th and Carpenter and eat one right away. You will die of pleasure. I’ve on been on an orange cheese kick this month – I’ll take my autumn where I can. I like the sunny color, I admit, and with Halloween around the corner, I’m hunting for that perfect cheese to nibble on the stoop while the ghouls of the neighborhood troll for candy. Let them have their Milky Way, I want my Mimolette. Mimolette comes in a nubby, spherical wheel, and when you cut it in half, it often reveals facial markings. Kidding. Cheesemonger Zeke Ferguson did the honors on this one, while we discussed his cheese-related tattoos. Carve it, and serve it, I say. Mimolette, that is. At 6 months, this cheese is mild and sweet with a toasty finish. Try it with Tamari-roasted pumpkin seeds and a nut brown ale or a Belgian Saison. If you come across some aged Mimolette with intense butterscotch notes, pour some Calvados, then stoke a fire and lay out the sheepskin rugs. Mimolette is a French cheese from Normandy with roots in the Netherlands, where Gouda and Edam are produced. The tangerine hue comes from Annatto, a plant dye that is also used to color Sparkenhoe Red Leicester. The slightly peppery taste of Annatto gives Mimolette a hint of smokiness – think of paprika. You can taste a little fire, but there’s nothing sharp or spicy. Even your trick-or-treaters could learn to like it. Here it is, unadorned, with some apples. Also nice. This is a good cheese for those with a delicate palate. Personally, I like a cheese that's more stubborn. But then, I am trying, I really am, to recognize those subtle notes, to love the un-ghoulish ones. And mild'n smoky Mimolette is a good place to start. Lots of people proclaim to be blue cheese haters, and this breaks my heart. Why? I can't stand the thought of anyone going to the grave without having eaten a wedge of Stilton or a spoonful of creamy Cashel. There are umpteen kinds of blue, and I firmly believe that for every person alive there is a variety that will change his or her mind forever. Willing to take the plunge? Here are four pairings to tempt even the meekest mouse. Full disclosure: This post is part of a series I'm writing for Di Bruno Bros., one of my fave cheese haunts in Philly. The deal is, I get paid to guest-blog for the store's site (dibruno.blogspot.com) on Wednesdays. I choose each topic myself. The highlight of our last tasting at Quince: these luscious Anjou pears stuffed with blue cheese, cranberries, and walnuts -- basted with cider-port sauce. We even managed to convert a tentative cheese eater with a new French boyfriend (she attended the tasting on the sly, while he was out of town). Because blue cheese makes some people nervous, we selected a mild temptress, Bleu d'Auvergne. However, you could ramp up the blue flavor by using Stilton in this recipe. Serve these pears on a bed of greens at Thanksgiving -- that's my plan. They are a little bit salad, a little bit dessert, with a nod to the world of stuffing. Perfect. Preheat oven to 375 degrees. Toss toasted walnuts, cranberries, and blue cheese in a bowl. Peel pears and slice in half, removing the core. In a new bowl, combine cider, port, and brown sugar. Arrange pear halves in a pie pan so that they fit snugly, and top each half with cheese-nut mixture. Then drizzle with cider mixture. Please reserve in advance by calling Quince in Philadelphia at 215.232.3425. Before you guffaw, let me tell you a wee story. Several weeks ago, Monsieur Fromage bought me a cup of coffee in the rain. We were at a farmers’ market, and I had taken cover under a shop awning while he ran to the local roaster. When he returned with a steaming cup, the coffee tasted unusually good. Maybe it was the rain. Maybe it was this particular roaster’s beans. But when I mewled and called it the best coffee I’d ever tasted, Monsieur Fromage gave me a wry smile. I took another sip. The coffee was rich and complex with the most wonderful mouthfeel. Was this possible? Was goat’s milk the secret to dreamy, creamy coffee? So, last week when we ran out of milk, I trotted off to the Fair Food Farmstand in Reading Terminal Market and when I reached the cooler, I noticed a small bottle of raw goat’s milk for sale. Why not? I thought. I’ll try this instead. Buying that bottle of goat's milk has inspired me to try it all kinds of ways -- in coffee, in smoothies. The best combination I've found is to add goat's milk to a wintery black tea. I’m partial to Cozy Almond, a Sri Lankan black that contains actual toasted almonds. With a slosh of goat’s milk, that cup of tea is just lovely. Who can I thank but Monsieur Fromage who knows that I love goat cheese almost above all else? Almost. That’s the key. If there are other lovers of goat's milk out there, give a bleat. I'd love to hear about any combinations that you enjoy. When I was a kid growing up in the Midwest, my folks spent money on two things: theater tickets and really good cheese. Every Saturday, my mother drove downtown to Cheese & Puppets, the one shop that sold imported cheeses, and brought home baguettes and stinkers. Emmenthaler, Raclette, Gruyere. Then we feasted, oh we feasted. My mother liked Alpine cheeses because they reminded her of her youth in Switzerland. Iowa, where we lived, was a Kraft ghetto, so those Alpines, with their strong barnyardy smells and nutty flavor profiles, took her right back to Geneva, to Zurich. Now, twenty years later, I find myself waxing nostalgic for those firm, zippy Alpines – probably because they remind me of my mother, who was and is every bit as firm and zippy as those cheeses (with her cleaning regimen and her love of fast cars and red capes). That’s why I fell hard for Unterwasser last weekend. It was and is everything I love about the cheeses of my youth – it’s strong in a sweet, nutty way with a firm body that turns creamy the minute it warms on your tongue. And the scent of barnyard, there’s only a touch of it. If I had to name a perfect Alpine cheese, it would be Unterwasser. Last weekend, I shared it with friends over a cheese-laden brunch, and we all agreed (even a pair of Texans) that it was a knock-out, a dream – especially when we drizzled a little caramel over it. Yes, I did say caramel. Vermont’s Fat Toad Caramel, a not-too-sugary cajeta from goat’s milk, made for a spectacular pairing. The sweet, milky taste of the sauce pulled out the warm, nutty notes in the cheese. Sweet mother of us all, what a glorious discovery. If you want to get your sweaty palms on some Unterwasser, your best bet is Fromaggio Kitchen. This Cambridge cheese shop offers great info on Swiss cheeses via the store’s blog, and the tiny Fromaggio Kitchen outpost in New York City’s Essex Street Market (where I bought my Unterwasser) is staffed by knowledgeable cheesemongers. Unterwasser, which means “Under Water,” is a washed-rind cheese made from raw cow’s milk. Try it in the morning with warm baguette, a latte, and a side of really good caramel sauce. You won’t believe you’re eating an Alpine. October is cheddar weather. It’s a good month for carrying a loaf of crusty bread out onto the rooftop, along with a wedge of cheese, and enjoying a bird’s eye view of the fall trees. A picnic in the air. I’m a fan of eating on the roof, but it’s a pain to haul too much up the staircase. That’s why bread and Keen’s Cheddar is a magical combo – Keen’s has flavor enough, without mustard or mayo. If I’m lucky, I’ll remember to put an apple in my pocket, but otherwise, I just grab bread and cheese, and off I go. What is this heaven? Why, that’s a wedge of goat's milk blue with a shrapnel shard of chocolate-covered bacon, atop an oaty biscuit. It’s what I ate for breakfast yesterday, and I haven’t stopped thinking about it since. Call it the new oyster shooter. I first read about Bleu du Bocage in a column by Janet Fletcher. Janet writes a brilliant cheese column for the San Francisco Chronicle, and she is my oracle. If Janet finds “toasty and faintly meaty aromas” in a cheese, I know that I will be able to find them, too. She has an astonishing nose. And so, this beautiful cheese needed a porcine accent, me thought. Plus a little dark chocolate, and yes, some walnut-flecked oat cakes. Fan me now, I can’t think about this pairing with out sweating just a little. I bought this wedge at Fromaggio Kitchen in Essex Street Market on the Lower East Side. Bleu du Bocage is not easy to find, so once I saw it – I knew it was the one, my breakfast blue. The cheesemonger, Jor Kane, formerly of the Almanac Market in Philadelphia, told me he could taste creamed spinach on the finish. I took a whiff and a nibble. Spot on! Creamed spinach, there it was. Meaty on the front end, vegetal on the finish – the Loire Valley has blown my mind again. Incidentally, this blue also danced along nicely to port-fig truffles. Note: These little treasures, like the bacon, came from Roni-Sue (also in the Essex Street Market). The Walnut Oat Crackers, mentioned above, come from the Fine Cheese Company. They are extraordinary. Here is what I learned this weekend: a radiator is very good for warming a baguette. I found this out by staying with our friends Noelle and Carolyn in Manhattan. They have a very aggressive heating system. I also learned that blue cheese and chocolate taste divine together. Especially if the chocolate has a little bacon in it. Roni-Sue's Pig Candy came recommended, and it fit in beautifully with hard-boiled eggs, baguette, and soft cheese. I think this may have been one of my favorite brunches of all time, and for that I have to thank Anne Saxelby, of Saxelby Cheese. She is the one who inspired me. She is the one who sold me some beautiful Summer Snow (pictured above), a sheep’s milk brie from Woodcock Farm in Vermont. It was a perfect cheese to drink with champagne, while wearing pajamas. We moved to the hard stuff later – and by that I mean beer-washed cheese (Harpersfield with Ommegang) and a heavenly blue with a spinachy finish (Bleu du Bocage). Not everyone loves cheese for breakfast, but I do. And so do Noelle and Carolyn. After a night of dancing, it was very restorative. I think, from now on, I will plan more cheese brunches, if only because I love going to sleep knowing that the crisper is full of little wedges that await me at first light. Here was this morning's spread. Later this week, I'll describe the cheeses in detail. Tune in for the Brunch Redux. I don’t know about you, but I am ready to start toasting things. It’s too early to key up the furnace, and so I am dreaming of the melted, the broiled. Next Saturday, I am going to shake up the universe with some gooey love. Over at Quince, the teeny cheese shop in my neighborhood, Nicole and I have plans to go postal on the toaster oven. Put on your wool socks and join us for a 3-course tasting of warm, bubbly, crispened…fromage. Who knows, there may even be spiced wine. You will get your cozy quotient, in case you have been in deficit. When: Saturday, October 23, 2010, 4 p.m.
What: This shenanigans costs $12. Please call the store to make a rezzie (215-232-3425). Gary Zimmer may just be one of the most radical people I met during my Wisconsin Cheese Media Tour last week. He and his two sons are producing a series of seasonal, grass-fed, raw-milk cheddars that illustrate how milk flavors change throughout the year. Zimmer, a farmer and dairy nutritionist, practices rotational grazing with his herd of 200 Holsteins in Avoca, Wis. His biodynamic farm is also a teaching space, where he shows farmers how to remineralize the soil – adding nutrients back into land that has been over-worked, over-grazed. Out at Otter Creek, the air smells sweet. Here, the cows get moved to new pasture every 12 hours. In summer, they graze on various digestable plants – usually a mixture of grasses and grains. Now that it’s fall, the fields are full of rye and winter barley. By mixing crops, he keeps his animals healthy and generates nutrient-rich soil. You can taste the quality of his grasslands in the milk that Otter Creek produces. Spring cheddar is mild and creamy with a sweet, nearly floral hook, while Summer is firmer and tangier with stronger grassy notes. Fall, my favorite, has a big bite on the front end that lasts and lasts. The mouthfeel is lovely. Otter Creek’s seasonal cheddars are not available year ‘round. Only seasonally. It’s something that some chefs and grocery managers find hard to understand. But the farmers at Otter Creek feel that’s part of their quiet revolution. Through cheese, they’re hoping to teach people about the seasonality of milk – something our grandparents probably understood. Otter Creek is available at select restaurants (such as Rick Bayless' Frontera Grill) and Whole Foods around the Midwest. With a name like Sparkenhoe, you know you are in for tradition. This golden cheese originated in 1754, when an English farmer began naming his bold-colored wheels after his prize bull, Old Sparkenhoe. Today, the recipe lives on. Since 2005, the Clark family of Leicester, England has been making Sparkenhoe the old-fashioned way, using raw milk from pasture-raised cows and natural orange coloring from the Annatto plant. To read more, please click here. This month, I wrote about Tomme de Linden Dale for my cheese column in Grid. Seeing this photo reminds me that I need to hustle down to the Rittenhouse Farmers’ Market to pick up another wheel. Cheesemaker Andrew Mellinger only sells his goat Tomme on Saturdays, and he’s got a batch of raw goat Tomme that should be available about now. This is such a lovely cheese – it has the most divine smell, like yeast and white grapes. The taste reminds me a little bit of Ossau Iraty, a Spanish sheep cheese with the same dense paste and olivey, nutty notes. Tomme de Linden Dale is fruitier, though, which makes it a beautiful cheese for serving alongside Asian pears. I happen to love the hand-drawn label on this cheese – a wise, old goat wearing a monocle. I’m guessing it was sketched by one of Mellinger’s six children. They’re all involved in the family goat farm in Ronks, PA – the same farm where Mellinger grew up. Cheese doesn’t get any more farmstead than this. Linden Dale Farm is a small operation. No website. No retail outlets. If you come across a wheel at a market around Pennsylvania, nab one. It’s an undiscovered beauty, and it keeps well. I just finished the last bite this week, and I bought this wheel back in August. If you want to check out other farmstead goat Tommes, consider Elk Mountain or Twig Farm Tomme. Both are aged goat cheeses with natural rinds. Rustic. Fabulous. In the last 72 hours, I have eaten umpteen kinds of cheese and visited seven cheesemakers around Wisconsin. My 3-day media tour was fascinating, and the thing that stands out at this moment – as I detox on my brother’s couch – is that cheese plants, like cheese itself, are imbued with a kind of terroir. At Roth Kase in Monroe, I took away an impression of impeccable cleanliness and regime. It’s a place where high-tech robots pass through dimly lit aging rooms, flipping wheels of cheese. And each employee wears a pair of white Crocs that never leave the building. Thousands of cheeses are made here, including gorgeous Gruyere and Buttermilk Blue, thanks to immaculate systemization. At Uplands, home to the nationally reknowned Pleasant Ridge Reserve, Mike Gingrich and Andy Hatch stand around in ballcaps, surrounded by blue ribbons. They make one cheese (a second will be released soon), and the vibe is mellow, the plant a single pole-barn building. Gingrich and Hatch are so finely attuned to their cheese, they can tell how the wheels are ripening just by smelling the air when they open the door of the aging room. No robots here. No white Crocs. The plant is as serene as the sloped hills surrounding it. But my favorite plant, the one that lives on in my mind, is Carr Valley in tiny LaValle. This 100-year old plant looks like a gas station in the middle of a corn field – it’s got a pop machine out front and a kitschy gift shop full of snow globes and bells. Walk into the “make room,” though, and you feel history. Sunlight streams through windows onto ancient-looking forms and presses, and the pasteurizer lingers in the corner like a giant squid haunting a bioluminescent reef. Something about the light makes me think of a Hopper painting or a reading room, full of newspapers, turning color with age. If a cheese plant can convey a sense of place, or terroir, as the French call it, Carr Valley does just that. I will never eat their squeaky curds without feeling a pang of nostalgia. I love a plush bus. I had no idea how nice it would be to travel by leather-lined coach, until I set foot in Wisconsin this week to join my first Cheese Media Tour. Thanks to the Wisconsin Milk Marketing Board, I am riding across the Plains with about 20 bloggers and print journalists from across the country, eating cheese and meeting cheesemakers. Fresh mozzarella at Crave Brothers', a dairy powered by a "manure digester." Here are the cow barns by night: 1,000 snoozing bovines. Those lights? That's the manure digester at work! This is George Crave, who looks like Sting. In a way, he is a rock star. 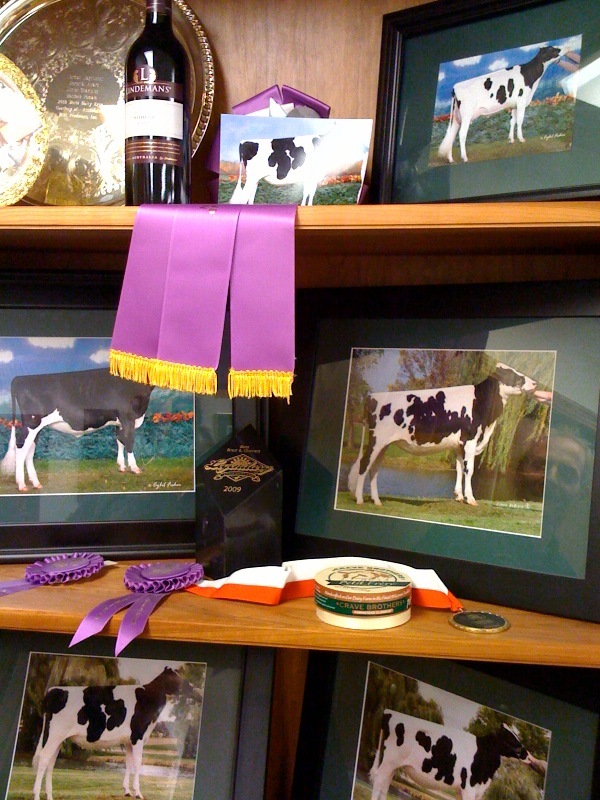 George Crave's show cow shrine. His current "beauty" is on top. George and Debbie Crave treated us to a fabulous farmstead meal that included a beautiful cheese plate of their Petit Fere (a washed rind) and mascarpone -- which Debbie served with homemade cranberry sauce and ginger snaps. I learned a few things about raising dairy cows. Each Holstein eats 100 lbs. of feed per day -- at Crave Brothers', they eat a combination of pasture grass, corn silage, alfalfa, and soybean meal. I also learned that George Crave realllly likes cows. "If I weren't at this dinner, I'd be out in the barn, with my boots on, looking at the cows," he told me at dinner. When I asked what he meant, George told me he loves to look for show cows, which he enters into contests. Past contestants have included Glamor, Gracious, Linen, and, most recently, Asia. "I like cheese," George said, "But I really like cows. At night, Debbie likes to read Bon Appetit, and I read Select Sires."